8:00 AM – Registration and check-in for individual runners and teams Save time by registering now! Pre-registered participants by June 14 will receive a free Dayton Muddler t-shirt. If you are preregistered you do not need to come at 8 AM. However, we encourage everyone to come at least 30 minutes before their start time. New Obstacles Coming This Year!! There will be two youth divisions this year. 12-15 and 11-under. While they will run the same course as the adults some obstacles will be modified or closed for the little ones. Music, Food Trucks, Beverages & Craft Beer Tent will be on the site! Please bring ID to obtain a bracelet for age verification if you are planning on visiting the beer tent. No alcohol can be given to persons without a valid ID. 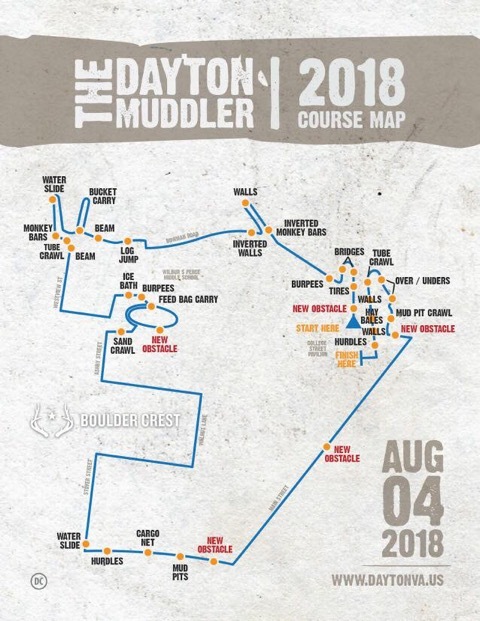 Check out image below for Dayton Muddler 2019 course — Note: We’re using the same course as in 2018, so ignore, for now, the use of last year’s map. The date of course for the Muddler and the 1/2 Marathon is Saturday, August 3rd!